I learned this recipe from my brother who made it a few Thanksgivings ago. I make it frequently for myself, often switching out the raisins for cranberries and pancetta for turkey bacon. It’s a very adaptable recipe that lends itself for using whatever is in your pantry. If you are in charge of the veggie side dish for next week’s holiday, I strongly suggest this one. Okay, I never measure anything so just use your best judgement. I’ll try to give approximates. This probably serves about 4 people if my quantities are good guesses. 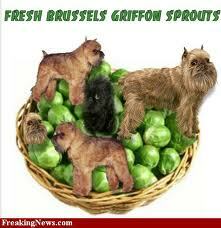 *1 basket of brussels sprouts, the small and tighter, thebetter. wash, cut in half, salt and pepper them, sprinkle with a tiny bit of lemon juice and set aside. *1 medium thick slice of pancetta, cut into 1/4″ squares. *a couple of tablespoons of olive oil. *1/4 sherry wine or other white wine- actually, red would probably be lovely too. Heat the olive oil in a heavy skillet. Saute the garlic and shallots for a minute until they are starting to look like they need more oil. Add the pancetta and continue sauteing until the pancetta starts to get crisp- a few minutes on medium heat. Set aside. 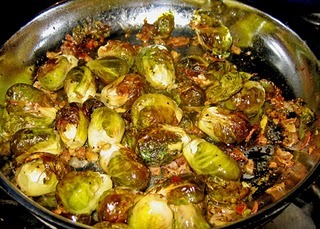 In the same pan with all of those delicious juices, add a tiny bit more oil if necessary and put those sprouts face down. Toss to coat, but then resist the urge to move them around for a few minutes. After they start to brown toss the raisins in and mix it all up. At this point the brussels sprouts should be almost fork tender. Add the pancetta/shallots/garlic mixture back into the pan and toss. Add the wine, bring up to high heat and cook down until the liquid evaporates. Deeeeelcious! Enjoy, and Happy Thanksgiving to all of you! >That looks super YUMMY!! Thanks for sharing.